Filter Material: Synthetic fiber with progressive construction, temperature resistant to 100°C (212°F), selfextinguishing class F1. Moisture resistant to 100% RH. Can be cleaned by washing or vacuuming for reuse. Replacement filter mats available on request. 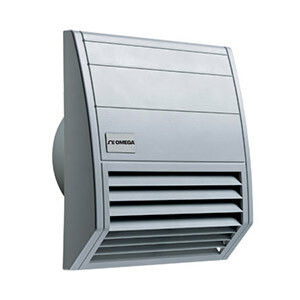 Standard filter fan, 24 m³/h (14 cfm). It needs exhaust filter. Standard filter fan, 63 m³/h (37 cfm). It needs exhaust filter. Standard filter fan, 117 m³/h (69 cfm). It needs exhaust filter.